Hey ya'll! I am so happy to be starting a new week. Last week was just crazy, I wrote a short post about all that was going on here if you wanna catch up. I am so glad I'm doing 100 percent better after my food poisoning. My husband is still having a whole lot of trouble with his MS tho. We have been doing a lot of research and calling different doctors to help him. I really love how good he handles it all. He stays really upbeat and loves to joke around a lot still. And I know it's gotta stink not being able to get around very well. Which brings me to the topic of my post today. Last weekend he was planning on going to his brother's house for a fantasy football draft party. He was having so much trouble walking tho, so we decided it would be easier to have everyone come to our house for it. I found out about the switch the day before the party. So my annoying "perfectionist" side got to work on cleaning the house. I even got out our carpet shampooer and went crazy cleaning the carpets. And then once the house was clean, I started thinking about how we could decorate for it. I'm a complete dork when it comes to throwing parties. Even if it's a group of 12 guys who could care less about it, I still wanted to do it. It's fun. 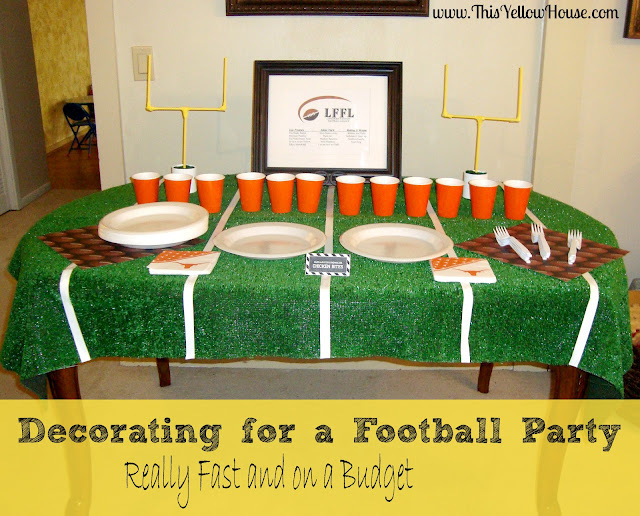 Plus I wanted to make my hubby's party special for him. He's gone through a lot lately and he needed something fun to do. I must confess first tho. I was a bad blogger. My pictures are really horrible and taken really fast. I almost didn't want to blog about this because the picture I took drove me crazy. I still cringe when I see it. This was taken before I straightened up everything on the table. And I didn't even get to take a picture with the food on the table. This was taken before it was really "complete". I was planning on taking better pictures of it "complete" but I was running out of time. I barely got everything ready when all the guys showed up. So here is what I did on really short notice and a small budget. I went to my favoritest place ever to get started. PINTEREST of course! And after searching Pinterest for some "pinspiration" I came up with a plan and ran to Lowe's, a craft store, and the grocery store to make it happen. I found an astro turf type rug at Lowe's. I first went to their garden center because I've heard before that they have big rolls of fake grass there that they can cut off as many yards as you need. But ours didn't. The lady at the garden center was really nice tho and once I told her what I needed she suggested I get a rug from the flooring department and cut it. So I found a pretty good size area rug for about $18 that I cut in half. I figured it would be a good investment for all our football type parties we will be throwing in the future. It was my "splurge" for the party but also my favorite part. I found some white electrical tape for a couple dollars that I bought to my make "yard lines". For our centerpiece for the food table, I grabbed a picture frame I was already using in our living room and added a printout of my husband's league logo (yes he made it's own logo, they are really into this stuff!) and under the logo the leagues divisions and teams. For the goal posts, I bought some wooden dowels at the craft store. I cut them into the right sizes and glued them together. To be extra safe (I really didn't want them falling apart in front of my husband's friends) I went over the joints with the electrical tape I used for the stripes. I just wanted to hold it together as well as I could. I then painted them yellow and stuck them in two little round boxes with styrofoam balls in each. I found the little round boxes at the craft store for a couple bucks but you could also use little vases or cups of some sort. I covered the top of them with green felt and painted the boxes white. I filled 12 small orange cups with french fries so each guy could grab one. We also had buffalo style chicken bites to snack on. I used what we already had when it came to forks, plates, cups, and napkins. I bought some cheap football themed scrapbook paper to add to the table to dress it up a bit more. I also made a banner, that I forgot to take a picture of! It was just a simple easy banner with the league name LFFL hanging above where we had the trophies. Yes I said trophies. We are that dorky. We made some trophies for the winner and the loser. And I will fill ya'll in with all the details tomorrow! OMG, Allie! This is so awesome! I pinned it because I'm totally doing this this year. 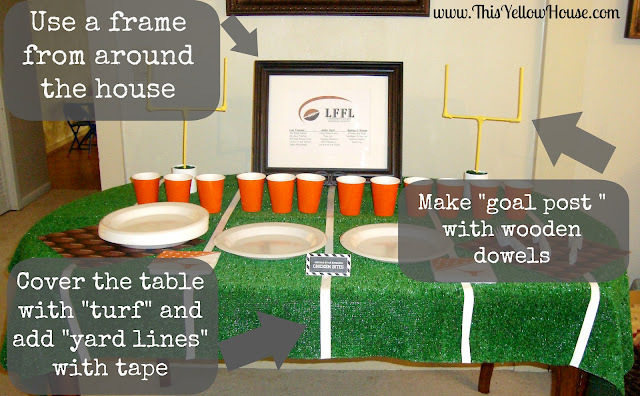 Soooo ready for football.. What neat idea's.. LOVE this.. ;)) Thanks sO much for sharing this evening. Wishing you a beautiful eveing.. xo..
ps: happiest new follower here too ;)) Yaaaye..